Welcome to our website. We are Belgian pupils of the last grade at "Miniemeninstituut", secondary school for commerce, foreign languages, tourism and informatics, taking part in the bilateral Comenius project "Ready to read me". This website will show our collaboration with the Polish pupils from Zespół szkół in Opalenica. You will be able to see the assignments we completed. On this website you will also get to know all the pupils taking part in this project personally. The pupils entering our next international project will also make their appearance on this website soon. For these Miniemeninstituut pupils the school year ends with a fairy tale. An Oscar Wilde fairy tale, more precisely. A whole year long, 7 last-year pupils of the junior office management section of Belgium's Miniemeninstituut secondary school worked hard to get their final assignment finished and to present it proudly at the final year ceremony. 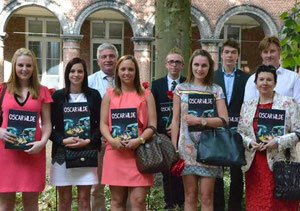 Together with their Polish partners from Opalenica they made an Oscar Wilde comic book collection. Click the group picture to read the newspaper article (in Dutch).